After staying flat and range bound for the entire session on Tuesday, the Markets saw a sharp upsurge, more so in the final hour of the trade and as a result, the benchmark NIFTY50 ended the day with a modest gain of 38.50 points or 0.37%. The Markets have posted yet another lifetime closing high and the liquidity has not yet stopped to chase the momentum. Going into trade on Wednesday, we will see volatility creeping in as well. We enter the penultimate day of the expiry of the current derivative series and we will see activities remain heavily dominated with rollovers. Wednesday will see Markets facing a tricky situation. A breakout has been attempted from 10490 level but we still require confirmation. 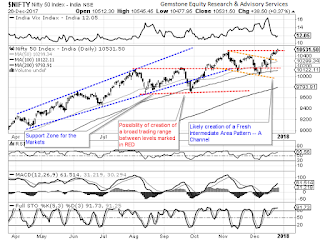 NIFTY will face resistance at 10540 and 10585 levels. The Relative Strength Index – RSI on the Daily Chart is 65.5629 and it continued to mark its 14-period high which is bullish. It does not show any divergence against the price. The Daily MACD stays bullish while trading above its signal line. A white body occurred on Candles but it shows no significant formations with it. Pattern analysis shows an attempt to break out above the 10490 by the Markets. However, a meaningful rally is yet to happen and the Markets await confirmation for that. Daily Stochastic remains highly overbought. Overall, Markets are demonstrating buoyant intent and we are likely to see this continuing tomorrow as well. However, with expiry approaching, it is likely that volatility will also make its presence felt. 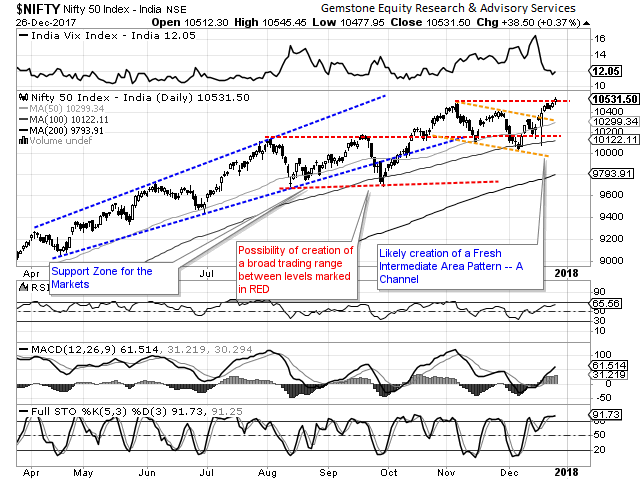 For the Markets to inch higher, it would be necessary for the Markets to trade above 10490. Any dip below this will force the Markets into consolidation once again. We recommend avoiding shorts completely. With the liquidity chasing the Markets, up moves will remain prone to likely volatile profit taking bouts from higher levels. Exposures should be continued to be kept modest and profits should be heavily protected at higher levels.